Laura Bassett is a New Hampshire native who grew up with folk music and the sea chanteys of the Mystic Sea Music Festival. After discovering the active folk singing community in Boston, she has since moved to Seattle, where she shares her love of both traditional and contemporary sea songs. Hank Cramer is one of the best-loved folksingers in the American West. He’s known for his booming bass voice, smooth picking on a vintage flat-top guitar, and a wry sense of humor. Hank’s repertoire is a mix of original, traditional, and contemporary folk songs. They tell the stories of cowboys, sailors, soldiers, miners, adventurers, and just plain drifters. That fits with Hank’s life story: he has been an underground miner, a professional soldier, shanty-man on a square-rigged sailing ship, wrangler for a high-country outfitter, and a world traveler. Those experiences make Hank’s music ring with a special authenticity. Mary Garvey is one of the Northwest’s most acclaimed and prolific songwriters. Her songs have been recorded by Gordon Bok and many others. Her songs celebrate maritime culture, especially that of the coast of southeastern Washington State and the lower Columbia River. Helen Gilbert hails from England and has a delightful voice flavored with her accent. She regularly leads the third-Thursday Pub Sing at TS McHugh’s, and you might see her Morris dancing around the Northwest. 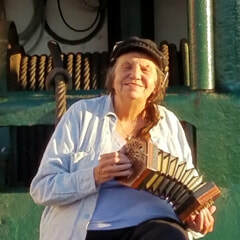 Along with traditional songs, she sings quite a few maritime songs and was a collaborator in compiling the Port Townsend Chantey Book. Once stuck on a deserted island with a guitar and a book of chantey lyrics without chords, Al developed his own delightful melodies and style of chantey singing! Al was one of the infamous Halibutts, recognized for keeping Ivar Haglund’s folk song traditions alive. He is a winner of the Seattle Stories of the Sea competition and has received two Parent’s Choice Foundation awards for children’s audio. 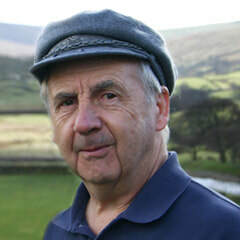 Al entertains internationally and around the Northwest, performing solo and with Doug Bright as the Marvelous Minstrel Boys. Visit Al Hisrch's website. Father/daughter duo Bob Jackson and Lynn Applegate have been singing and playing folk music together for over 40 years. 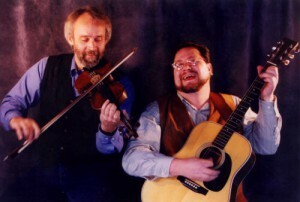 They perform locally at the Northwest Folklife Festival, on a radio show, and at a variety of community concerts. 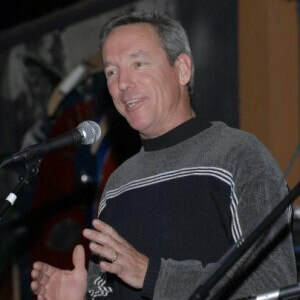 Bob is an accomplished banjo and guitar player who enjoys playing sea shanties, bluegrass, folk music, and comedic songs. Lynn specializes in contemporary folk music and re-configuring traditional music of all genres. 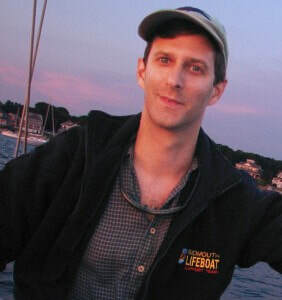 David Kessler is a recent transplant from Boston who brilliantly sings catchy maritime tunes that we all need to learn. He grew up in New England, learned to sail as a teenager, and has crewed on a variety of boats and ships — from dinghies, to a Tartan 30, to the tall ship H.M.S. Rose. 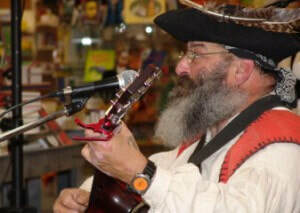 David has been singing maritime, folk, and drinking songs for many years. David co-founded the MIT Chantey & Maritime Sing, the North-East Chantey Sing calendar, the Single Malt & Song Society, and the Liberty Clipper’s annual Black Tot Day sing and sail. 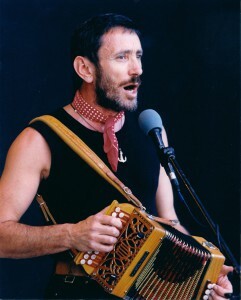 He has performed at Northwest Folklife Festival with the group Strikes A Bell, and at the Princeton Folk Music Festival. David Kessler and David Perasso combine their keen sense of music and create tight harmonies that beautifully and meaningfully expresses their maritime, folk, and Americana repertoires. They have sung at the Princeton Folk Music Festival and the Northwest Folklife Festival, as a duo and in the group Strikes A Bell. David Perasso mixes a love for the American folk revival, English and Scottish songs, and his ancestral Italian songs. David Kessler collects songs from everyone he meets — some from sailing, some from Vermont, some from his family’s table, and some from foreign travelers. Brian, actually Dr. Brian Maskew, originally hails from Yorkshire, England and keeps up the tradition of singing British folk and maritime songs. Brian has cut CDs with Hank Cramer and has been on the faculty of most of the Shanty Camps held around the Northwest during the past few years. Mariide, known for her performance teaching of maritime history and lore for schools and museums, has one of the most powerful and saltiest voices around. Mariide’s musical roots are in the 1960s Seattle folk scene, and she has been one of the mainstays of the Northwest maritime music scene ever since. She was the founder of St. Elmo’s Choir, and was one of the original members of the Victory Sings at Sea group. In 1966 she became the open-mic host at the Last Exit, a happening that set the benchmark for Seattle open mics. A longstanding social justice and environmental activist, she is known for her witty songwriting on political and social themes. 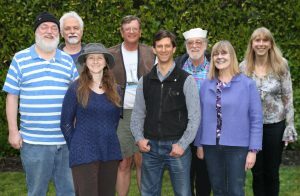 Wayne has been singing chanteys and maritime songs for over a decade, focusing on songs with rich tones reflecting the fishing and maritime trades. Wayne is the host of Northwest Seaport’s Chantey Sing series and sings in the local group Strikes A Bell. His own nautical experience on the high seas and local waters helps to anchor his interpretations of traditional chanteys, new and local sea songs, and even a few overlooked classics by Gilbert and Sullivan. William Pint & Felicia Dale rank among North America’s most exciting and acclaimed nautical performers. William Pint & Felicia Dale raise the humble sea chantey to unexpected heights! Their music fits into the world of modern folk, rock and popular song, but it’s rich with myth, narrative, rhythm & rhyme from the days of the tall ships. Be it with guitar, flute, or hurdy-gurdy, they have played on both sides of the pond and have been generating exciting music and dynamic CDs. Dan Quinn is a professional captain of sail and motor and has sailed tall ships in the South Seas. Not only that, but Dan sings great tunes and shows a bit of the blarney in his tall tales of the sea. You might find him spinning yarns at sea story, liar, and fisher poet contests, where he’s won some prizes. ​Raised in the Bay Area and attending college in Berkley in the 60s (he swears he has no memory of that), Dan also studied opera and received the training that makes his voice one of the most notable and powerful in the folk music community. A true folkie, Dan’s repertoire spans decades. It also spans three octaves which allow him to sing lead, bass, or make strange noises. He plays guitar, mountain dulcimer, mandolin, mandola, six-string banjo, and a mean set of spoons. Dan also is a “bro” with The Whateverly Brothers. 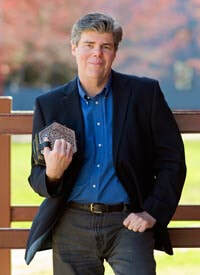 ​Chris is a talented musician performing solo and in maritime and other folk groups around the Puget Sound. Chris is known for her strong yet eloquent singing voice, her adept instrumentals, and her charming stage presence. 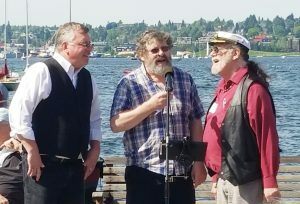 ​Shanghaied on the Willamette is the lively musical duo of Jonathan Lay and Gordy Euler who perform songs and tunes plundered from land and sea. These include traditional Celtic, English, and old-time American music, especially music of the sea and waterways. Shanghaied on the Willamette accompanies their vocal harmonies with a fleet of acoustic instruments. Visit Shanghaied on the Willamette’s website. ​From the rocky shores of Spanaway Bay, south of the Puget Sound and directly above the center of the earth, sail the rollicking folk duo Spanaway Bay. 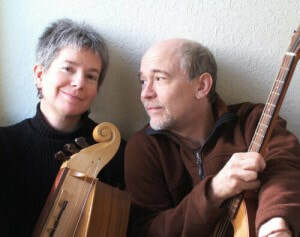 Kent and Carol have been engaging audiences throughout the Puget Sound with an eclectic mélange of Maritime, Celtic, English and American folk songs since their trial by fire at the Port Townsend Wooden Boat Festival some years ago. This lively duo are the favorite chantey singers aboard the 1913 schooner Adventuress. Additionally, they perform with Broadside & the Handsome Cabin Boys, and Sanger & Didele. The audience is encouraged to join in on the highly singable choruses, so taste the salty, bluesy flavor of Spanaway Bay! Strikes A Bell is a group of chantey singers from Seattle with a big sound filled with harmonies. They lead folks in singing familiar “singable chanties” that, well, strikes a bell. They also sing forebitters and beautiful lesser known songs that resonate and are fun to sing along with! Strikes A Bell is Laura Bassett, Jean Geiger, David Kessler, Wayne Palsson, David Perasso, Dan Roberts, Steve Whinihan, and Mary Wilson. ​After sailing for 23 years as an Able Seaman and Quatermaster in the Merchant Marine, Tugboat Bromberg has settled in the great state of Washington. A veteran of the music scene, Tugboat sings, writes songs, and performs a variety of musical styles ranging from country and bluegrass to nautical and piratical. Visit Tugboat Bromberg’s MySpace page. ​Jeff Warner’s traditional songs, rich in local history and a sense of place, present the latest news from the distant past. Community songs, banjo tunes, 18th-century New England hymns, and sailor songs highlight his amusing and informative all-ages programs. Jeff grew up listening to the songs and stories of his father Frank Warner and the traditional singers his parents met during their folksong collecting trips through rural America. He accompanied his parents on their later field trips. The Whateverly Brothers (Dan Roberts and Chris Glanister, and Rob Kneisler) deliver rich harmonies with instrumental frosting. Drawing from their varied musical history, they turn sea songs on edge with their well-crafted harmonies of traditional chanteys and contemporary arrangements. The Bros harken to the folksinger tradition that “No musical style is sacred.” Hoist anchor! Raise the glass! Sing along! Visit The Whateverly Brothers’ website.